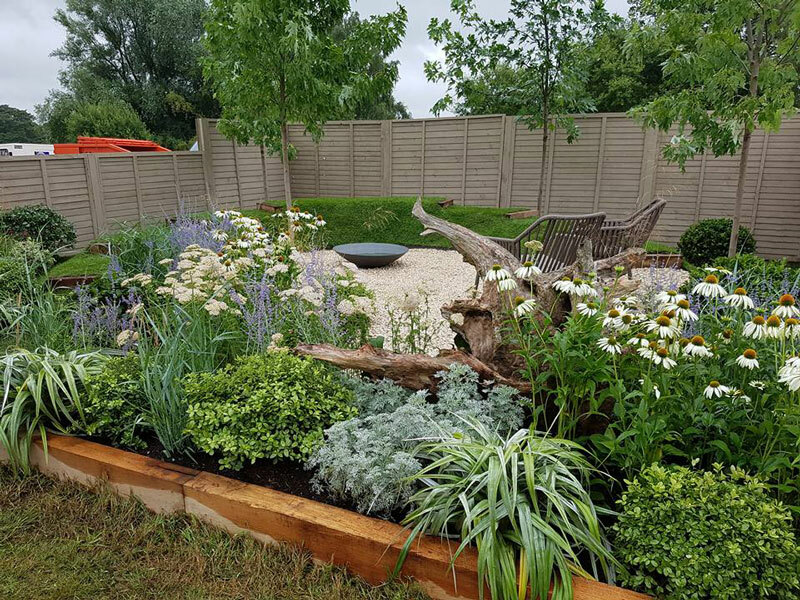 Harrowden Products in Winning Garden Design. 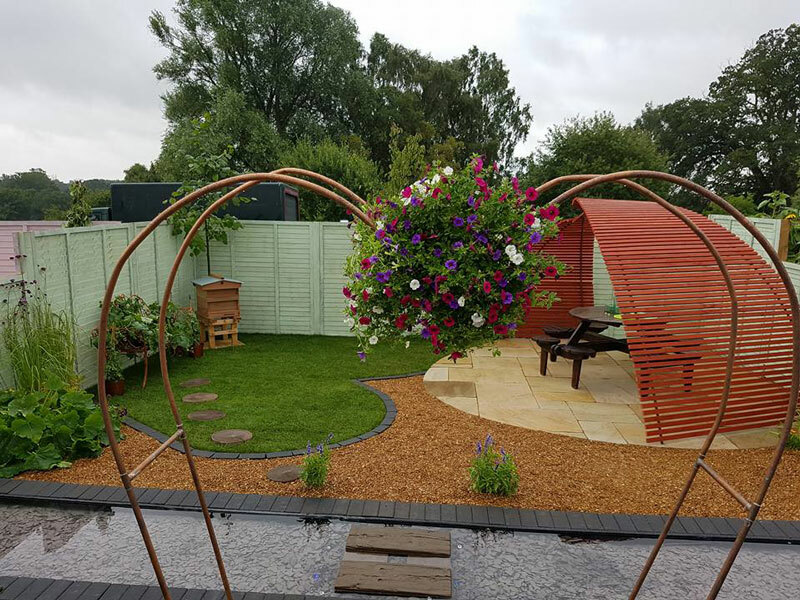 A quick round up of where Harrowden Turf’s products have been used in show gardens around the UK. 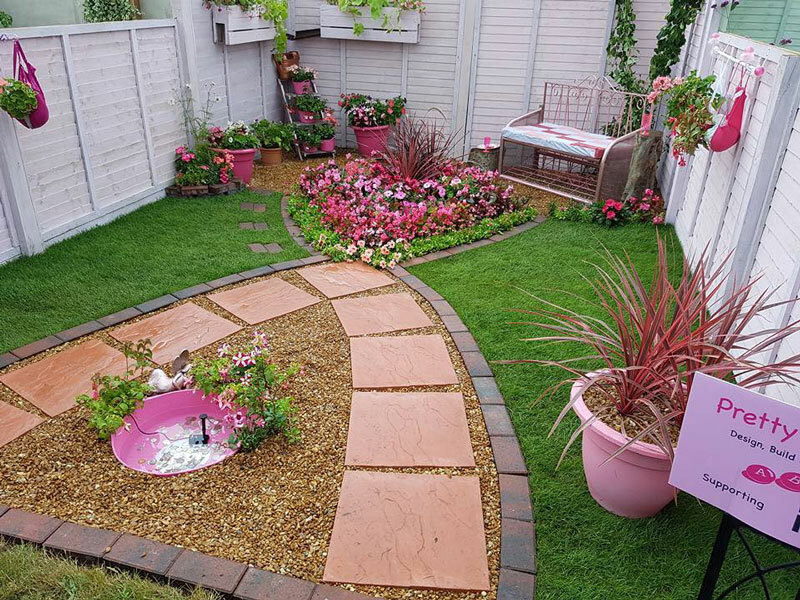 Get ready to see some stunning garden design ideas. 2017 has been a great year so far for Harrowden Turf. 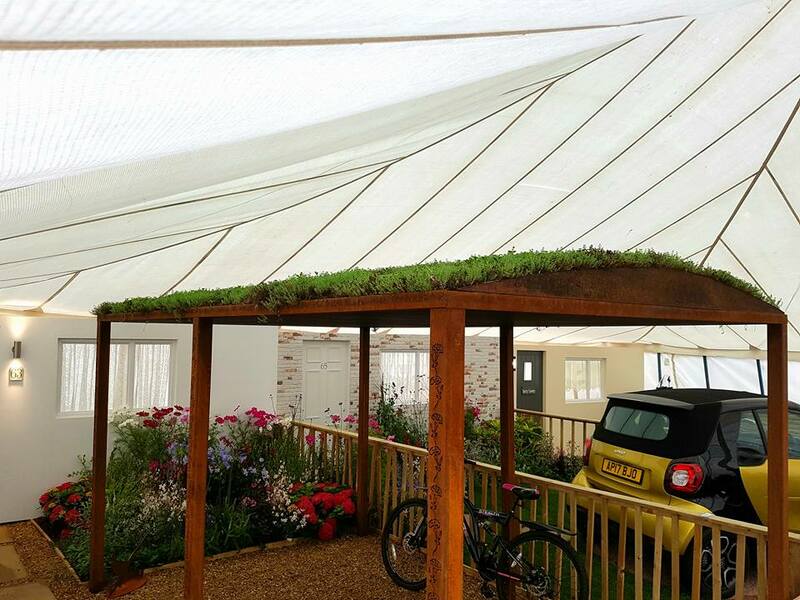 Our Meadowmat, Enviromat and lawn turf have featured in several show gardens this year. Some of the gardens were awarded medals at their respective shows. All of the gardens looked amazing and were a true testiment to British Garden Design. Five stars worth of fabulous results for our customer Nicholas Moreton. Nicholas is a fine art sculptor who used Meadowmat wild flower matting to set the scene for some of his pieces. This was actually a trade stand but Nicholas told us that visitors to the show thought it was a show garden. I can understand why they would think that. The art pieces were displayed as if they were in an actual garden. It’s a great way of helping potential buyers to visualise how these spectacular sculptures could look in their own outdoor rooms. Personally I love the contrast between the strong lines of Nicholas’s sculptures and the soft shapes and colours of the wildflowers. A wildflower meadow is in a constant state of change and even though the artwork is static, it will look different from month to month because of its changing surroundings. 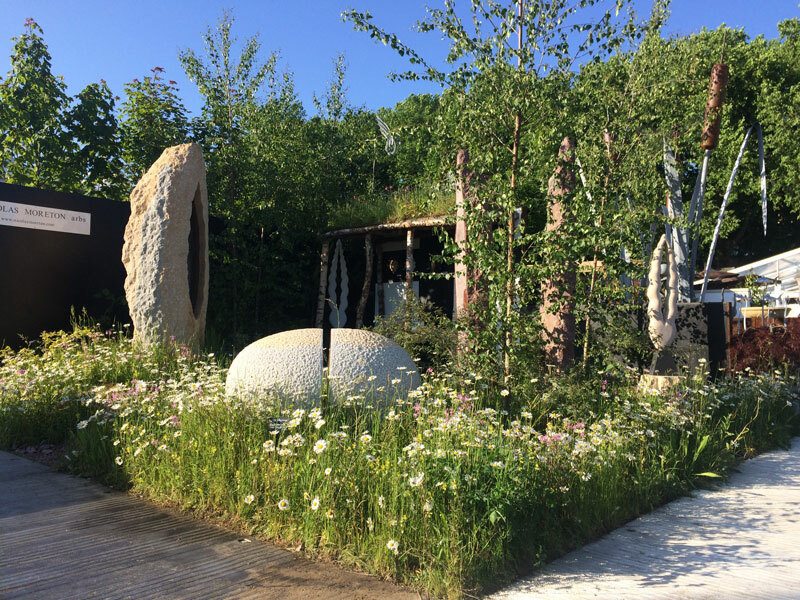 Every June, Gardeners in Scotland celebrate Garden Design and all things horticultural at the Gardening Scotland show in Edinburgh. This year, depicted an ancient Scottish story and used Meadowmat to help set the scene. SRUC in Edinburgh is Scotlands rural education college. It focusses on farming, horticulture and garden design. 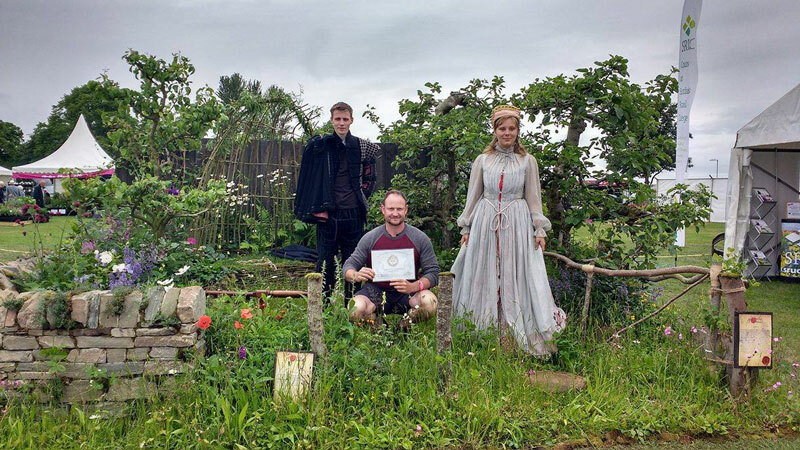 The 2nd year garden design students chose to commemorate the death of Lord Darnley 450 years ago by recreating a tudor orchard scene. The Sandringham Garden Show in Norfolk is a small, regional show with a friendly feel. It’s held on the Queen’s estate at Sandringham and was originally concieved to encourate estate workers to grow and preserve their own food. The show is in it’s 136th year and it seems to get bigger and better every year. Sandringham is less than 1 hour’s drive from Harrowden’s farm in Norfolk. 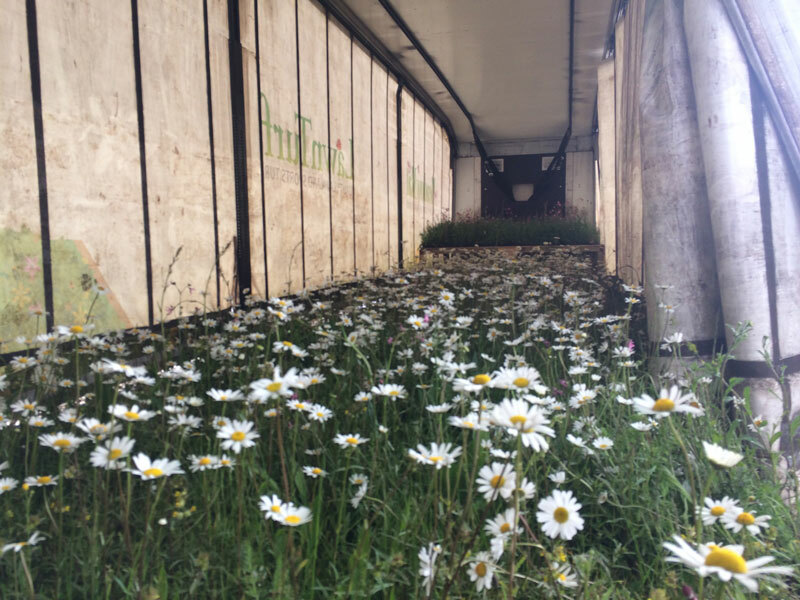 Each year, one of our biggest customers, Holly Landscapes, delivers turf to the show for use in the show gardens. Here are some of the results. Curvy and symetrical, these lawns have everything! Using different hues of a single colour creates quite an eyecatching display. But where would this garden be without the lawn. I just love the shape of this lawn. Curvy AND symmetrical. I like that the edging is just the right height – so a person like me could easily mow the lawn and edge it at the same time. 10/10 from me! I love curves and this garden has lots of them. I also love bees – so this one has extra appeal. Although a few more flowers would have made it better for me. This is a great, easy maintenance garden. Somewhere truly relaxing where the only work to be done is regular mowing. Probably my favourite design feature in this garden – and one that I will probably use in my own plot – is the stepping stones across the lawn. Incredibly practical, yet beautiful too. If you can tear your eyes away from the lovely planting in the foreground you’ll spot the interestingly shaped lawn area at the back of the garden. My elderly parents would love this garden for its serentity. My grandchildren would enjoy for the adventure area. I can imagine then running up and down those steps. Lovely Enviromat Green Roof in the winning show garden. This was the Gold Medal winner at the Sandringham Show. Demonstrating ideas for making best use of a small front garden. The car is on a turntable. That really caught my eye because I am somebody who is rubbish at reversing. I’ve digressed. This shelter is perfect for a front garden. The green roof is low maintenance and much nicer to look at than plain old waterproofing. It’s like a double decker garden. With plants on the top deck and usefullness on the bottom deck. Design was by Paul Welford of Thistlefield Plants.